The global appeal of cosmetic products to the consumer is unmistakable, with a reach that extends virtually across every household in the USA. There has been increasing interest in natural remedies containing plant-based ingredients, popularly perceived to be less harmful than products made from synthetic chemical ingredients. The true prevalence of allergic reactions to cosmetics in the general population remains unknown, as reactions are often not reported because those affected simply discontinue use of the agent instead of seeking medical care. Herbal ingredients in cosmetics may be associated with allergic contact dermatitis, a type IV hypersensitivity reaction resulting in inflammatory skin eruptions characterized by pruritis, erythematous vesicles, and papules. Preservatives and fragrances are responsible for many cases of allergic contact dermatitis, but it is important for clinicians to recognize less common allergens and be suspicious of certain ingredients in plant-based products. This article aims to emphasize risks associated with use of cosmetics marketed as “natural” and to review specific botanical allergens implicated in causing allergic contact dermatitis. 1. Allergic contact dermatitis (ACD) is a type IV (delayed) hypersensitivity reaction which can occur to naturally derived products.2. Extracts derived from Compositae plants, propolis, and limonene, along with a number of essential oils and waxes, are popular in cosmetics and serve as botanical sources increasingly implicated in causing adverse skin reactions.3. Pinpointing the allergen through patch testing and instituting avoidance measures is the definitive treatment for ACD. Contact dermatitis can be defined as inflammation resulting from contact of a substance with the skin surface. The most frequent types of contact dermatitis are irritant contact dermatitis (ICD) and allergic contact dermatitis (ACD). The more common form is ICD, which occurs when substances such as solvents or other caustic chemicals cause damage to skin immediately after exposure. These reactions take place without prior immunologic sensitization, while ACD results from a cell-mediated, type IV hypersensitivity reaction requiring prior exposure to an allergen [1•]. The point prevalence of ACD is estimated at 20 % in the general population [2••, 3]. ACD almost always causes pruritus but may also be associated with the stinging, burning, or pain that is more often associated with ICD [1•, 4]. Generally, the dermatitis occurs within 48–96 h after exposure and can recur upon re-exposure with the responsible allergen [1•]. Contact dermatitis often manifests in individuals who consider themselves to have “sensitive skin.” This subjective identification is defined as an increased susceptibility of skin to allergens or irritants. The pathophysiology of sensitive skin is poorly understood but appears to demonstrate less tolerance to frequent and prolonged use of cosmetics and toiletries . One survey has suggested that as many as 50 % of women and 40 % of men considered themselves to have sensitive skin, making this a more prevalent problem than was previously thought and therefore a highly active area of research by cosmetics manufacturers . There is global appeal of cosmetic products to the consumer, with a reach that extends virtually across every household in the United States. Avoidance of certain ingredients from use is often the only effective measure that patients with sensitive skin can take in preventing ACD triggered by cosmetic products. Cosmeceuticals, or cosmetics purported to have medicinal or drug-like activity, are a fast-growing component of the health industry, with promises to amplify the health and beauty of sensitive skin types. These products flood the personal care market, generating billions of dollars in global revenue annually, but can be associated with adverse effects. It is important to note that the true prevalence of allergic reactions to cosmetics remains unknown, as reactions are often not reported because those affected simply discontinue use of the agent instead of seeking medical care. Many cosmeceuticals are marketed at adolescents and children, who are generally as prone to ACD as adults. Often, parents allow natural-based products that become a gateway to cosmetics. Allergens associated with the Compositae plant family, for example, are important in the setting of childhood atopic eczema and have been shown to also induce contact sensitization in pediatric populations . The belief that plant products have beneficial effects without causing harm has led to increased sales of “natural” remedies [6•], defined as products containing plant-based, herbal ingredients, which are often not subject to the same degree of regulation by the Food and Drug Administration in comparison to drugs, biologics, and medical devices. Topical cosmetics containing botanical ingredients are often falsely believed by consumers to be safer than their synthetic or chemical counterparts. Although preservatives and fragrances are the most common sensitizers in skin care products and facial makeup overall , certain botanical ingredients have notably been implicated in causing ACD in susceptible individuals. The goals of this paper are to demonstrate that herbal ingredients found in cosmetics can be associated with allergic contact dermatitis and to emphasize potential risks associated with use of such cosmetic products. 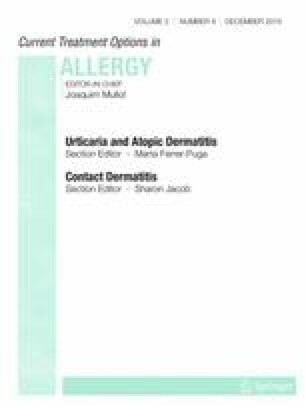 To better assist clinicians when advising patients which products to avoid, specific botanical allergens implicated in causing cosmetic contact dermatitis will be further discussed in the following paragraphs. Growing popularity of products containing essential oils has led to a rise in reports of ACD linked to use of these products. Essential oils are aromatic substances of variable composition typically extracted from plants and animals. They are frequently used in cosmetics and perfumes . Essential oils are, in part, made up of sesquiterpenes, a diverse group of compounds naturally found in insects and a number of plant families, including Compositae plants. Sesquiterpenes represent a known cause of allergic reactions . Although the exact frequency of these reactions is not known, ACD attributed to essential oils is disproportionately higher in certain occupational groups, including massage and aroma therapists, cosmetics manufacturers, hairdressers, and beauticians . Tea tree oil, extracted from the leaves of the Melaleuca alternifolia tree, is known for its antimicrobial and therapeutic effects [6•]. It is now widely used in facial moisturizers, shampoos, massage oils, aromatherapy candles, compresses, and detergents [6•]. Several studies have reported increasing prevalence of positive reactions to tea tree oil [9, 10, 11]. Data from recent North American Contact Dermatitis Group (NACDG) patch test results indicate a 0.9 % prevalence of positive patch test reactions to tea tree oil [12••]. The allergen most likely responsible for the sensitizing property of tea tree oil is terpinen-4-ol, also responsible for its beneficial antimicrobial effects [6•]. Peppermint oil, extracted from Mentha piperita, is a perennial herb in the Labiatae family used as a flavoring agent and fragrance in lip balms and moisturizers and can also be found in mouthwash, toothpaste, dental floss, breath fresheners, chewing gum, and teas [6•, 13, 14]. Topical preparations of peppermint oil have been used to relieve pruritus and inflammation. Constituents of peppermint oil include menthol, menthone, carvone, pulegone, and limonene, the last of which is gaining increasing recognition as an emerging allergen [6•]. ACD to peppermint oil has been reported with direct application to skin . A 2010 case series published by Tran et al. examined four patients with ACD of the lips and perioral area following exposure to a Burt’s Bees lip balm product containing peppermint oil. Patch testing confirmed peppermint oil as the likely source of ACD in all four individuals . As a new addition to the NACDG standard screening series of 70 allergens (allergEAZE; SmartPractice, Calgary, Canada) in 2009 [6•], 2 % Mentha piperita oil in petrolatum showed a 0.4 % prevalence of positive patch test reactions in results collected as part of the 2011–2012 NACDG patch-testing data [12••]. Lavender has been utilized for centuries as a therapeutic and cosmetic agent. Its essential oil remains a popular ingredient in personal care and household products . Despite its potential therapeutic uses, lavender oil has been associated with ACD. In one cross-sectional study of 1483 Japanese patients suspected of having contact dermatitis secondary to cosmetic use, patch-testing data collected over a 9-year period showed an increase in positive reaction rates to lavender from 1.1 % in 1990 to 13.9 % in 1998 . ACD due to lavender often occurs in massage therapists who demonstrate a high prevalence of hand dermatitis from oils, lotions, and creams due to occupational exposure [16, 17]. The main two components of lavender essential oil are linalyl acetate and linalool, constituting 40 and 50 % of natural lavender oil, respectively [18•]. Both are weak allergens and sensitizers in pure form . Linalyl acetate is a fragrance terpene frequently found in cosmetic and household products and is hypothesized to act as a prehapten or a low-sensitizing compound that transforms into a hapten via oxidation following exposure to air [18•]. A patch-testing study of 1717 patients conducted by Hagvall et al. resulted in 2.2 % positive reactions to oxidized linalyl acetate [18•]. Thus, in the oxidized form, linalyl acetate may be a more prevalent fragrance allergen than previously acknowledged [18•]. Eucalyptus oil has been used medicinally for over 100 years for its antibacterial, antiviral, antifungal, and anti-inflammatory properties . It is found in topical antiseptics, soaps, mouthwashes, balms, and inhalants for colds and the flu and is now increasingly used in body creams, shower gels, and facial cleansers . Topically applied eucalyptus oil is generally regarded as safe, but rare reports of ACD caused by eucalyptus oil do exist and point to its main constituent, 1,8-cineole, as the causative allergen [19, 20]. Patch-testing data using 2 % eucalyptus oil in petrolatum indicate a 0.24–1.5 % prevalence of positive reactions [21, 22, 23]. Ylang-ylang oil, derived from the flowers of the Cananga odorata tree, is found in a wide variety of household items, including scented candles and soaps . Because it is purported to decrease anxiety and have a soothing effect on the skin, it has become a popular ingredient in cosmetic products like moisturizing creams, massage oils, and perfumes. Ylang-ylang oil is a known cause of ACD and contains linalool, geraniol derivatives, and isoeugenol. Isoeugenol is the component responsible for the sensitizing capacity of ylang-ylang oil . Frequency of allergy to ylang-ylang oil has decreased in Japan since the reduction of the maximum concentration of isoeugenol in cosmetic products by the International Fragrance Association [24, 25]. Among the essential oils, ylang-ylang oil was found to be the most likely to illicit a positive reaction, according to patch-testing data from the Information Network of Departments of Dermatology, a contact allergy surveillance network in Germany, Switzerland, and Austria . Occupational sensitization to ylang-ylang oil is of higher risk for manicurists, hairdressers, aromatherapists, and cosmetics manufacturers . The Compositae plant family contains some of the most historically valued medicinal plants, including German and Roman chamomile (Chamomilla recutita and Anthemis nobilis, respectively), echinacea (Echinacea purpurea), dandelion (Taraxacum officinale), pyrethrum daisy (Chrysanthemum cinerariaefolium), marigold (Calendula officinalis), and lesser known great burdock (Arctium lappa), once valued for its hair-growth-stimulating and antiseptic effects . Compositae are also recognized as an important cause of ACD. Members of this family are now widely utilized in cosmetic formulations, leading to speculation that sensitization to Compositae species will increase . Compositae-containing cosmetics are thought to provoke dermatitis in susceptible individuals because they contain sesquiterpene lactones (SLs), the same class of naturally occurring terpenes responsible for the allergenicity of essential oils [6•, 10]. SLs contain the structural unit α-methylene-γ-butyrolactone, known for its biological activity and therefore used in screening for Compositae allergy [6•, 26]. Although numerous Compositae plants have been implicated in causing ACD, only two species, arnica (Arnica montana) and elecampane (Inula helenium), are considered to cause a high relative prevalence of sensitization . Chamomile, although recognizable and versatile, is rarely associated with ACD in spite of its widespread use . Compositae mix and sesquiterpene lactone mix can be used in patch testing when ACD to the Compositae family is suspected (Table 1). Once used mainly as a folk remedy throughout Europe as far back as the sixteenth century, arnica’s wound-healing effects are now used in homeopathic preparations, herbal cosmetics, sanitary products, herbal liquors, soaps, bath additives, massage oils, first aid ointments, and wound dressings . Helenalin and xanthalongin are the two SLs suspected of giving rise to the sensitizing properties of arnica [10, 27]. Sensitization to arnica occurs via contact with arnica flowers, other SL-containing Compositae species, or topical preparations containing arnica. Arnica is one of only five Compositae plant species screened for in the NACDG Compositae mix I. A 2001 study by Reider et al. patch tested 443 individuals and found 1.13 % to be sensitive to arnica; of those with positive reactions, three out of five recalled using a topical agent containing arnica . Once used by ancient Greeks and Romans to treat skin diseases, elecampane is now used more in homemade syrups and teas for treatment of cough and other respiratory illnesses than it is for dermatologic ailments, mainly because the sensitization potential of elecampane is so high . It contains at least 17 different SLs, the most important of which are alantolactone and isoalantolactone, which can cause contact allergy . Even brief contact with 1 % concentration of elecampane extract can cause irritation and sensitization . Nevertheless, interest in elecampane as an ingredient of herbal cosmetics has not been entirely abandoned. Books reviewing natural cosmetics continue to recommend it for the treatment of acne, eczema, and general beauty care . Lichens are plant-like organisms, consisting of a fungus living in a mutually beneficial relationship with an alga or cyanobacterium [6•]. Found worldwide, lichens produce a number of biologically active compounds effective against viruses, fungi, protozoa, and bacteria . Recently, lichen extracts have even demonstrated activity against vancomycin-resistant Enterococcus and methicillin-resistant Staphylococcus aureus . This association with antimicrobial effects has made lichens a popular ingredient in topical personal care products and cosmetics, especially deodorants, moisturizers, and healing creams [6•, 29]. Usnic acid, produced by lichens, is the most commonly extracted component and one of the principle allergens reported to cause ACD in exposed individuals [29, 31]. Historically, instances of ACD attributable to usnic acid occurred in foresters and lichen pickers, but increasing lichen use in cosmetics has resulted in reports of sensitivity in the general public . A lichen acid mix including usnic acid and two additional lichen-associated allergens, atranorin and everinic acids, is available as part of a supplemental plant tray (Chemotechnique Diagnostics, Velinge, Sweden) [6•]. Fragrance mix I does contain oak moss absolute, extracted from the lichen Evernia prunastri, but there is no known cross-reactivity between oak moss absolute and lichen acid mix [6•]. Adding lichen extracts to the patch test series should be considered in patients using products containing botanical, natural, organic, or aromatherapy-type ingredients [29, 31]. Henna, derived from the flowering plant Lawsonia inermis, has been used for over 4000 years as a dye for coloring and tattooing skin, hair, and nails, particularly in Islamic and Hindu cultures [6•, 32•]. It is also used for its medicinal purposes, which are said to include anti-inflammatory, antipyretic, and antimycotic properties [32•]. When applied topically, natural henna stains the skin a rusty red color and is termed “red henna.” The reddish staining is due to a pigment called lawsone (2-hydroxy-1,4-naphthoquinone). Red henna is regarded as an infrequent sensitizer; it is the increasingly popular “black henna” (natural henna adulterated with paraphenylenediamine) that is fashionable especially in western adolescents and young adults and is now recognized as an important cause of adverse cutaneous reactions [32•]. “Black henna” temporary skin tattoos are laced with p-phenylenediamine (PPD) to enhance the dyeing process of the natural henna, by decreasing drying time, increasing the longevity, and giving the appearance of a permanent-type tattoo [32•]. PPD, labeled a “strong sensitizer” by the US Consumer Product Safety Commission, is a synthetic aromatic amine additive present in an estimated 70 % of all hair dye products . Its notoriety in causing contact sensitization earned it the title of “Allergen of the Year” in 2006 by the journal DERMATITIS . A Danish study comparing rates of adverse skin reactions among hairdressers versus a control group from the general population matched for age, gender, and region showed that black henna tattoos induced contact allergy to PPD in 2.5 % of the general population . Once sensitized to PPD, individuals may suffer from ACD not only related to future use of PPD-containing hair dyes but also to compounds sharing structural similarity to PPD caused by cross-reactivity [32•]. In many cases, the sensitizer in henna products is PPD, but ACD may also be secondary to lawsone pigment itself [32•]. The American Contact Dermatitis Society (ACDS) Core Series does contain PPD as a standard allergen and is sufficient for screening in most cases of ACD to black henna-containing products [6•]. Pure henna can be commercially purchased for testing purposes. Monitoring trends in contact allergy is challenging in the face of the dynamic and ever-evolving cosmetics industry. The literature periodically reports on newer allergens gaining recognition within the dermatology community for their suspected roles in ACD. Propolis is made by honeybees to lend support and structure to beehives . Poplar tree species, particularly Populus nigra (“black poplar”), are the primary sources of propolis in North America and Europe [37•]. It is a complex, resinous substance used in lipsticks, lip balms, lotions, shampoos, and conditioners as well as cough syrup and lozenges . First implicated in the emergence of ACD in the 1970s, propolis is regarded as a potent skin sensitizer but has nevertheless been used for centuries for its antibacterial and anti-inflammatory properties [36, 37•, 38]. Once a leading cause of ACD in beekeepers, propolis has been linked to a rising number of cases of non-occupational ACD over the last two decades in part due to increasing use in cosmetics [37•]. Recent studies report frequencies of sensitization to propolis ranging from 1.4 to 3.5 % [37•, 39, 40, 41], with one small Polish study in 2008 showing prevalence as high as 15 % . The NACDG and the British Contact Dermatitis Society (BCDS) began including propolis in their standard series in 2007 . Among the more than 50 constituents that comprise propolis, caffeic acid esters are believed to be the most important sensitizers other than propolis itself [37•, 43]. Caffeic acid is a substituted cinnamic acid, a compound used frequently in the manufacturing of perfumes and a known allergen whose related compounds, cinnamic aldehyde and cinnamic alcohol, are included in supplemental fragrance patch-testing trays used to capture fragrance allergies otherwise missed by the standard screening trays [37•, 44]. Limonene, the main fragrance constituent of citrus in the plant family Rutaceae, occurs naturally in the essential oils of lemons, oranges, lavender, lemongrass, peppermint, laurel, and eucalyptus . It is widely used as a fragrance substance in cosmetics, personal care products, and scented household cleaning products and is a frequent contact allergen [36, 45]. Limonene rose in popularity in the 1980s for industrial use because it was considered eco-friendly compared to its organic solvent counterparts. When exposed to air, however, it easily oxidizes to products with significant sensitizing capacity, such as limonene oxide, l-carvone, and limonene hydroperoxides . A 2014 Finnish Institute of Occupational Health case report of 511 patients with suspected occupational skin disease demonstrated limonene to be an important source of ACD, highlighting 14 (2.7 %) patients with confirmed occupational contact allergy to limonene. Five of these patients had all used the same hand-cleansing lotion containing limonene . The NACDG added d-limonene (3 %) to its 70-allergen standard series in 2009, with positive patch test reaction rate doubling from 0.1 to 0.2 % between 2010 and 2012 [12••]. Castor oil is a triglyceride obtained from the seeds of the Ricinus communis plant . It is commonly used in lipstick as a humectant and pigment stabilizer due to its lubricant properties but is also found in nail lacquer remover, lotions, moisturizers, and soaps [46, 47]. Ricinoleic acid is the main fatty acid associated with castor oil and is believed to be the responsible allergen in castor oil-related ACD [46, 47]. It is gaining popularity as an alternative to propylene glycol, an organic compound used for similar purposes but associated with more irritant and allergenic potential [48•]. Valued as a hair strengthener and moisturizer, argan oil is obtained from the Argania spinosa tree endemic to southwest Morocco [49•]. It contains high levels of oleic, linoleic, palmitic, and stearic acids, which are also found in olive oil. In addition, argan oil contains several natural phenols, including caffeic acid, the same compound determined to be the culprit allergen in patients sensitive to propolis [37•, 43, 49•]. When ACD was suspected in a patient with eczematous scalp lesions after use of a new hair product containing argan oil, patch testing with olive oil, a known sensitizer, was also performed given its similar ingredient profile [49•]. Results showed positive reaction only to argan oil, suggesting that a substance other than the oleic part of argan oil is the agent responsible for inducing sensitization. This case is the only report of ACD to argan oil in literature; further studies are necessary to identify the most likely sensitizing chemical within argan oil [49•]. In rare cases, vegetable and tree waxes used to thicken makeup may cause ACD. Carnauba wax is the hardest natural wax known with a chemical structure of 85 % esters . Obtained from the palm tree Copernicia prunifera, carnauba wax is commonly used in shoe polishes, automobile, floor, and furniture waxes and for coating tablets. It is also found in mascaras, eye shadows, eyeliners, and lipsticks because of its emollient properties and thick finish [51•]. The first reported case of ACD caused solely by carnauba wax confirmed by patch testing was documented in 2013 in a 33-year-old woman presenting with contact dermatitis affecting the lips, after using a new lip balm. Patch testing with all lip balm ingredients yielded a positive reaction only to carnauba wax [51•]. Another botanical wax recently implicated in causing ACD is a vegetable wax obtained from the candelilla shrub (species Euphorbiacea). Like carnauba wax, candelilla wax is used as a thickening agent in cosmetic formulations. With only 35 % esters and over 50 % hydrocarbons, candelilla wax is softer than carnauba wax and produces a glossy finish . It is found in lip balms, lipsticks, creams, mascaras, and lotions. ACD related to candelilla wax was first described in 2013 when a 25-year-old woman with a history of atopic dermatitis presented with intractable chelitis. Patch testing using the patient’s personal products revealed a robust response to a lip balm, with further testing proving candelilla wax to be the causative substance. Discontinuation of use of the lip balm resulted in resolution of the chelitis [52•]. The gold standard in proper assessment of ACD is the patch test. It involves exposing patients to suspect allergens in a standardized method in order to elucidate the cause of the reaction . In evaluating for a delayed-type hypersensitivity reaction, known allergens at specific concentrations are tested on the patient’s upper back under occlusion for 48 h, with readings performed at 48 and 96 h and classified by strength of the reaction . There are several standard or baseline panels designed to screen for the most common allergens in individuals undergoing patch testing for suspected ACD. Often employed in the United States are the 70-allergen North American Baseline series (allergEAZE; SmartPractice, Calgary, Canada), the 65-allergen North American Extended Baseline, the 80-allergen North American Comprehensive series (Chemotechnique Diagnostics, Vellinge, Sweden), and the Thin-layer Rapid Use Epicutaneous (T.R.U.E.) Test series of 36 allergens (SmartPractice, Phoenix, AZ). A standard screening panel alone, however, may result in overlooked relevant allergens, limiting the utility of patch testing in identifying less common causes of ACD. The aforementioned standard panels do include some cosmetically relevant allergens, but important cosmetic and botanical allergens may go undetected by current screening protocols. The addition of supplemental allergens to a standard series can increase the diagnostic accuracy of patch testing when there is high clinical suspicion for a cosmetic or botanical contact allergy [6•, 53]. Table 2 summarizes selected allergens included in a supplemental plant tray (Chemotechnique Diagnostics) not part of the North American Standard or T.R.U.E. Test panels. Allergenic plant extracts included in this expanded series are diallyl disulfide (a cause of ACD in those handling Allium genus plants such as garlic), α-methylene-γ-butyrolactone, and several members of the Compositae plant family [6•]. Among the fragrance allergens commonly implicated in ACD, fragrance mix I and mix II (Chemotechnique Diagnostics) have elicited an allergic response in 9.6 and 6 % of the general population, respectively . Despite this response rate, Wenk et al. found 36 % of their study population of patients with eyelid dermatitis to test positive for allergens in their supplemental fragrance series, even after a negative reaction to fragrances in the standard series . Thus, the use of both the standard patch-testing series and a fragrance tray may be beneficial in determining the cause of ACD (Table 3). The definitive treatment of ACD is to identify and avoid culprit allergens, whether synthetic or natural . Recommending avoidance of allergens in cosmetics can prove to be a frustrating and daunting task for patients. Constant attention to product labels in search of trigger ingredients with complex names and synonyms is difficult and can lead to poorly managed and recurrent ACD [1•]. It is the physician’s role to provide assistance to patients in finding substitutes and alternative products free of the offending allergen. Pharmacologic options are available when an allergen cannot be identified or eliminated. In such cases, topical corticosteroids are recommended. Oral antihistamines such as diphenhydramine and hydroxyzine may be used to relieve pruritus associated with ACD. For patients with primary involvement of the face or intertriginous areas, topical immunomodulators such as tacrolimus 0.1 % ointment or pimecrolimus 1 % cream may be used. In moderate to severe cases, refractory to initial treatment measures, systemic corticosteroids like oral prednisone may be initiated and gradually tapered over a 2–3-week period . Phototherapy and excimer lasers have also been shown to be effective in cases of refractory ACD. For debilitating chronic ACD unresponsive to repeated doses of systemic corticosteroids, a steroid-sparing immunomodulator may be necessary. These include methotrexate, cyclosporine, azathioprine, and mycophenolate mofetil . The utility of dietary modification in cosmeceutical ACD remains controversial. While there is some indication that diet may play a role in pathogenesis of ACD, there is currently insufficient evidence to support instituting routine dietary changes in those suffering adverse reactions to topical botanical products . However, it is important to note that some members of the Compositae family, besides being important in medicinals, are also edible and used for flavoring certain foods and drinks. Although rare, systemic contact dermatitis following ingestion of chamomile tea derived from the Chamomilla recutita plant has been reported . ACD is one of the most important dermatologic disorders worldwide and has the potential to cause significant morbidity and decreased quality of life, as well as having major economic implications and loss of vocational productivity . Cosmetics remain ubiquitous, with current trends indicating an increase in popularity of herbal and natural products perceived to be less toxic by consumers. ACD due to these products is concerning because the prevalence is likely higher than most recent estimates. Clinicians should be aware of common herbal allergens in cosmetic products and be able to recognize the clinical presentation of allergic reactions caused by cosmetics with the help of thorough history taking and familiarity with a variety of inflammatory skin conditions. Patient education and allergen avoidance lead to an improved quality of life and earlier resolution of symptoms, both of which can be achieved by providing counseling regarding the safety and efficacy of botanical products, patch testing, and arming patients with a list of products free of target allergens [1•]. Giving simple written guidance and resources, tailored to the individual, is the most effective way to increase compliance and ameliorate ACD-associated morbidity . Sonya Krishnan, Alison Ehrlich, and Brittany Oliver have no conflicts. Monica Rengifo Pardo reports other from Jansen Pharmaceuticals, during the conduct of the study; other from Jansen Pharmaceuticals. This article does not contain any studies with human or animal subjects performed by the author.